Super Bowl 50 takes place on Sunday, February 7, 2016. 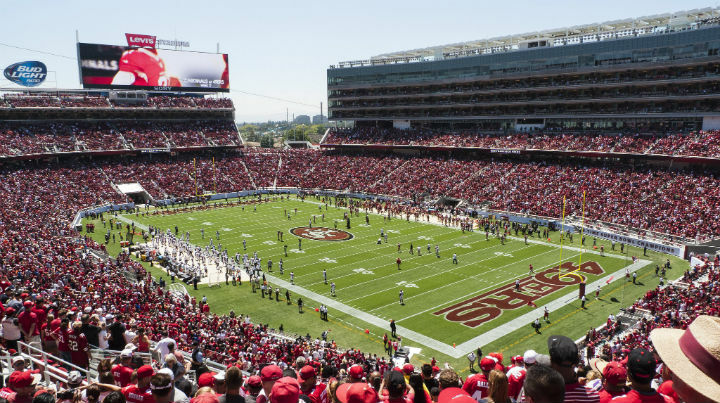 American football’s championship game is being held at Levi’s Stadium, located in the San Francisco Bay Area. No Roman numerals this year—the NFL wants to emphasize the golden anniversary of the Big Game. That, and “Super Bowl L” probably doesn’t look as impressive. The game this year is being televised on CBS, with kickoff at 6:30 PM Eastern Time. This year’s halftime show performers are Coldplay, Bruno Mars, and Beyonce. Whether or not Jabberjaw makes a return appearance from last year is debatable. Commercials for this year’s game are running $5 million for 30 seconds. Debuting during this year’s game is CBS’ new CBS Sports logo and graphics package for its sports broadcasts. The current logo has been used since 1981. The new logo keeps with modern design trends—a sans serif font and flatter appearance. As for how to watch the game online, CBS will stream the entire Super Bowl live, including the commercials (and presumably also the halftime show). CBS also won’t require a cable TV subscription to watch the streaming coverage, to the relief of cord cutters everywhere. Devices available to watch on include in (apparently) any web browser (at CBS Sports’ website) and on the CBS Sports apps/channels for Roku, Apple TV, XBox One, Chromecast, and Windows 10. For mobile devices, things aren’t free or as open; live streaming is only available for Verizon customers via the NFL Mobile app. Tablets, however, are mentioned under “your computer or tablet at CBSSports.com,” separately from “mobile devices” (read: smartphones). Thus, iPad and Android tablet users should be OK. While Windows 10 is specifically mentioned, users of any OS should be able to watch the game in their browsers, including Mac and Linux users. CBS mentions their use of an “in-house player,” which is presumably Flash based. Thus, I assume any web browser with Flash installed should be able to stream the game.